Message types in BigMailer can be thought of interest lists or opt-out lists. They help you define what message types your customers should be getting and how your customers can manage their interests and opt-out preferences. There are 2 kind of message types in BigMailer: system-defined and user-defined. 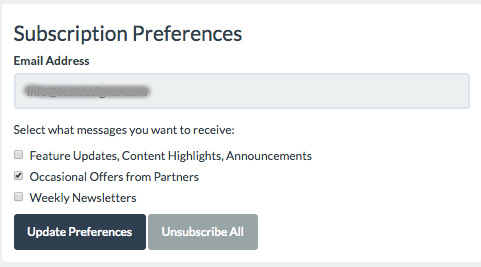 All Brand Communications (Implied) – this is a parent for all message types and is linked to customer-facing option to “Unsubscribe All” on the opt-out page. Account Related Communications (not customer facing): – this message type should be used on automation or transactional campaigns when the message sent to a customer is directly related to their account activity (confirmation of user action, pending automated change to user account, receipts or payment failure notices, etc.). When this message type is selected on the campaign creation step, the unsubscribe link isn’t enforced in the email template and the user can’t opt-out from receiving this message type. Adding message types is optional, but highly recommended step before any campaigns are added or scheduled. Message types help your customers manage their communication preferences on a more granular level, as an alternative to default global opt-out which blocks all further communications from your brand. You get the idea. Many retailers use in-house email solutions that allow this level of control on user preferences, like the example for Raymour & Flanigan on the right. If you have a good example from an email provider that’s not geared towards enterprise customers please share it with us – we would love to write a blog post with extended analysis on opt-out practices. Next, click on Add Message Type button on the right, add the Name on next page and click Add. All done! 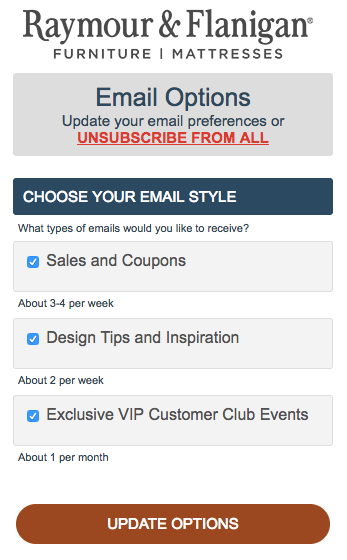 Your new message type will now appear in 2 places – on any campaign create/edit screen and on the unsubscribe page. Consider mentioning email frequency in the message type name, for example “Monthly Product Updates” or “Weekly Newsletter” to help your customers manage their preferences. 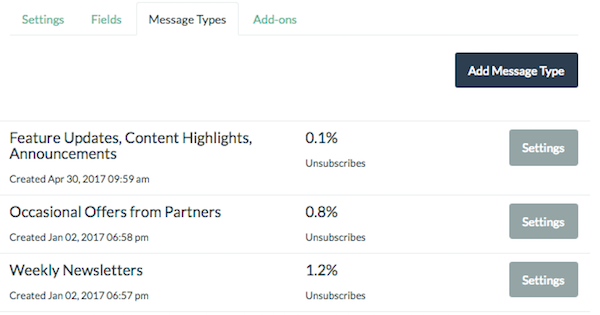 Once you have your message types used in your campaigns, your list view will have opt-out stats listed for each type. Got questions or feedback for us? We would love to hear from you.